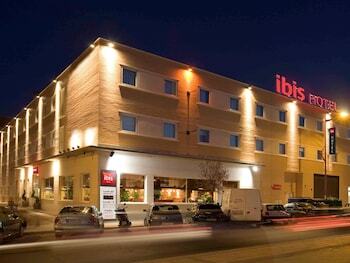 With a stay at Hotel ibis Madrid Getafe in Getafe, you'll be within a 15-minute drive of Vicente Calderon Stadium and Coliseum Alfonso Perez. Featured amenities include a 24-hour business center, dry cleaning/laundry services, and a 24-hour front desk. Self parking (subject to charges) is available onsite. When you stay at La Alberguería in Canamero, you'll be in a national park and 14 minutes by car from Geopark Visitor Center. Free self parking is available onsite. Located in Selva, this villa is within a 15-minute drive of Church of Sant Domingo and Museu de Sa Jugueta Antiga. Free self parking is available onsite. When you stay at Green Line Bon Sol Apartamentos in Ibiza, you'll be near the beach, within a 15-minute drive of Las Salinas Beach and Ibiza Castle. With a stay at Camping Igara de San Sebastián in San Sebastian, you'll be within a 15-minute drive of Parque Aiete and Concha Promenade. Self parking (subject to charges) is available onsite. Located in Denia, Serviden Retiro Park II is in the suburbs, within a 5-minute drive of Les Marines Beach and Denia Castle and Archaeological Museum. Free self parking is available onsite. When you stay at Casa Rural La Torea in Pilona, you'll be next to a golf course and 14 minutes by car from Cueva del Sidrón. Free self parking is available onsite.